On a road of London less travelled by, row upon row of towering council housing buildings shine brightly in the cold winter sun. Past Myatts Fields, then Angell Town and finally Loughborough Estate, along the crescent Milbrook Road Lies Ebony Horse Club. The warm, comforting scent of hay hits my nose before my eyes pick out the tall grey horse watching me. He snorts and one ear darts forwards and then back again, listening to the sounds around him. In the yard, a small group of children are learning about how to tack up the ponies – you can immediately tell that they haven’t been around horses before. For who would guess that amid the bleak backdrop of Brixton, 9 horses with shaggy soft winter coats would have a home. 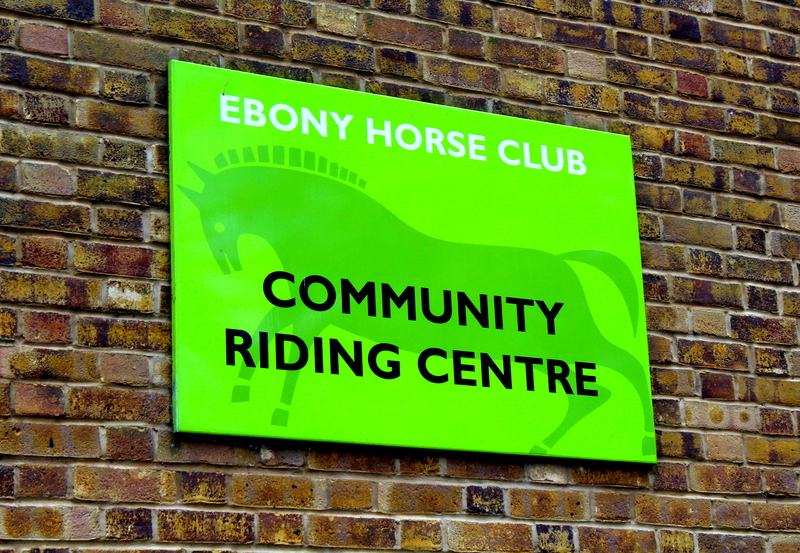 Ebony Horse Club operates in Coldharbour Ward, Brixton – one of the most disadvantaged inner city neighbourhoods in the country. There is a historic legacy of under-achievement in schools, high rates of teenage pregnancy and negative stereotypes of young people, gang violence and drug related crime. Difficulty in entering the labour market results in high rates of unemployment and low aspirations amongst certain groups. 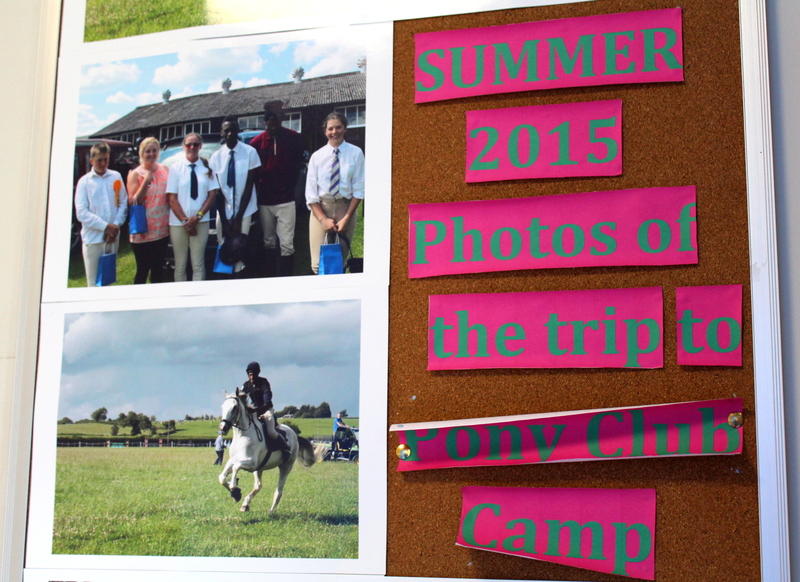 Ebony Horse Club provides the opportunity to think and gain new experiences outside the box of negative stereotypes – and to benefit from the powerful, life-changing influence that contact with horses can bring. 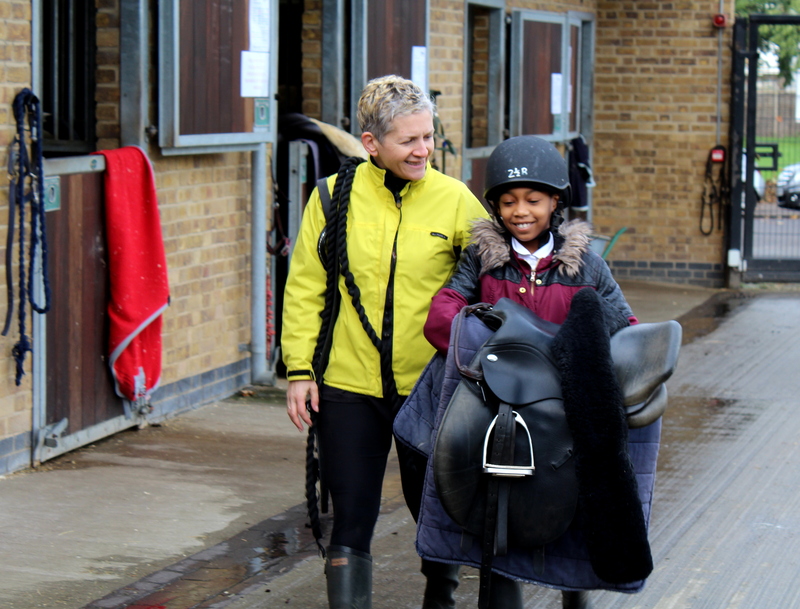 We offer much more than riding lessons, mentoring children who experience significant challenges at school and at home – challenges that can profoundly affect their ability to achieve later in life. Through the support and experiences members have at Ebony, all are encouraged to exceed their own expectations, and many are inspired to go on to college, university or horse-related careers. 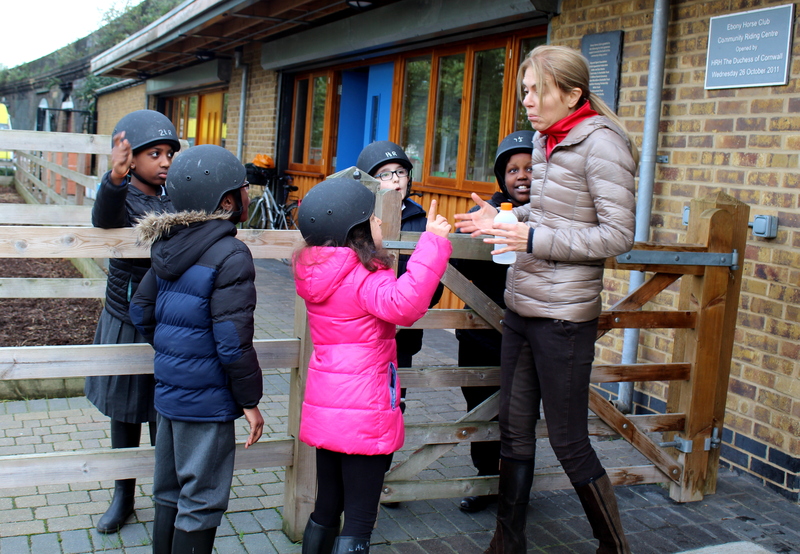 On weekdays, groups of local school kids visit the stables as part of their school P.E. lessons for the term. 3 children ride at a time for 20 mins, while the next 3 learn about tacking up and looking after the horses and then they rotate. When the first three children entered the arena, I could immediately see that while some of them were confident (even cheeky), their steps faltered as they first hung in the corner and then approached the ponies warily. Dennis, a seven year old boy with a lovely smile, was the first kid I worked with. I placed the mounting block in front of him and watched as he climbed it with trepidation. Heather, a regular volunteer, tightened the girth on Buddy the calm and dozy black and white cob and he shook his head in protest. Dennis was terrified by this small movement but Heather soothed his nerves by likening his movement to fidgeting. As he sighed, I saw his body relax and lean back into the saddle naturally. By the end of the class he had ridden at a walk with his eyes closed and his hands stretched out on either side of him, learning that it’s not the hands that keep you on but your body. He was brave enough to reach forward and touch Buddy’s ears and was all smiles. I can’t describe how much of a change I saw and how special it was to witness that confidence grow – I immediately asked Heather about regular volunteering options! The kids who come during the day will either come once or regularly – each school has different approaches, as some want every kid to have a go while others want to send the kids they feel will most benefit (which will often be the most difficult children). Winston Churchill said that ‘there’s something about the outside of a horse that is good for the inside of a man’ – and whether it’s a horse or a pony, a prized thoroughbred or a steady old cob, I firmly believe it’s good for the inside of us all – men, women and children alike. A horse doesn’t see your colour, your background or your past crimes, he only sees the way you treat him. 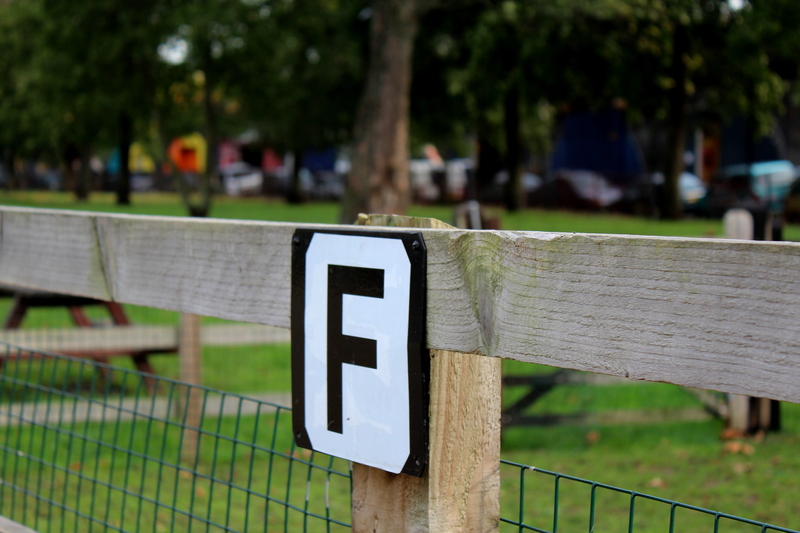 If the children want to continue riding, the Club runs evening sessions at a very subsidised rate of £7/hour (or free for those who cannot afford it). 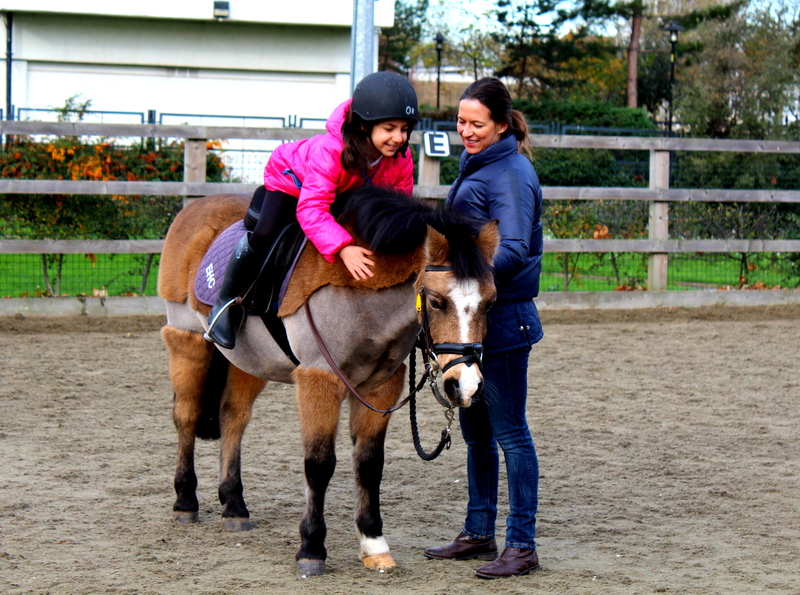 The club members are totally involved in all aspects of the club from riding to looking after the horses, looking after and teaching the younger kids all the way through to taking part in competitions and pony racing. They organise a getaway camp to Wales every summer and a number of the club riders go on to continue their education at equine colleges. 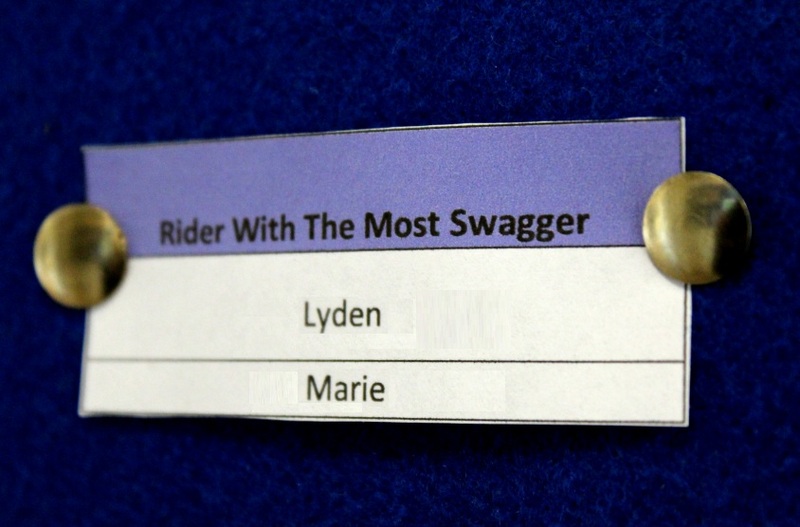 You can read more about the riders here. 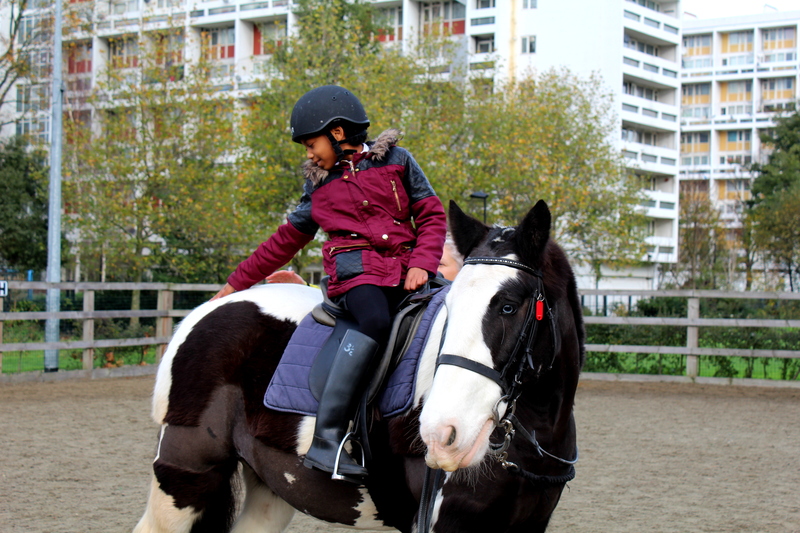 The club isn’t just about riding though, as the kids also take part in mentoring, equine care classes and even trips into London. It’s important that all the children show personal skills such as punctuality, regular attendance, commitment to improve and team work, and prizes are given out every year to those who have shown these qualities. One of the regular cup winners a while back was a boy called Nathan Foster – a local kid who found Ebony Horse Club at the age of 7. He rode for 12 years with the club and became very close to Ros Spearing, the founder until his death in 2007. Nathan was fatally shot near Brixton station accidentally as two youths argued over the theft of a gold chain, a tragic situation of being in the wrong place at the wrong time. At his funeral, two of his friends rode behind the procession on horseback as a final salute. As the curtain of night is drawn across the estates, it gives them a very different feel. 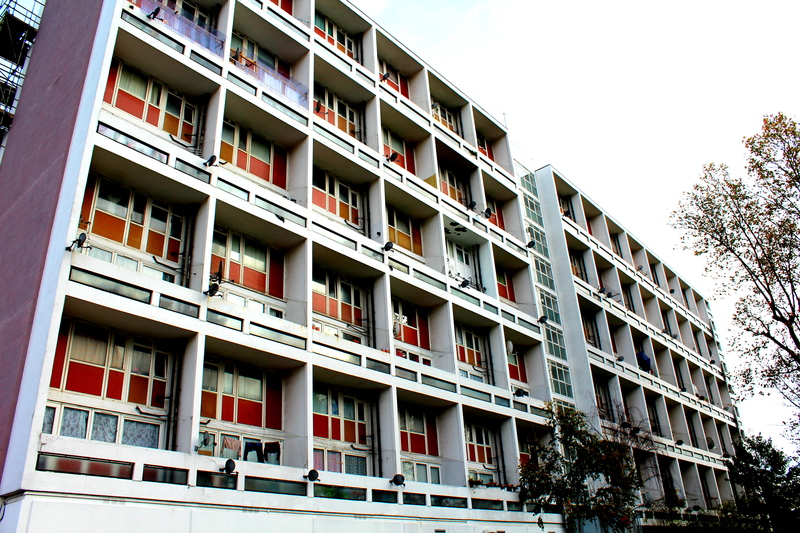 It is true that they have a sense of community unlike other parts of London where no one even knows their neighbour, however in the light of day it’s all too easy to forget the sadness and unnecessary bloodshed that these concrete buildings have seen. 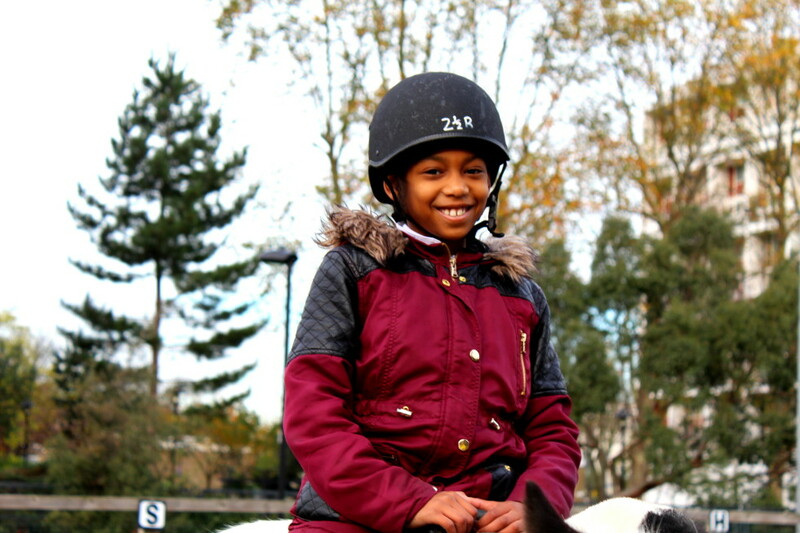 Ebony Horse Club gives these children a different path, a safe haven among their 4 legged friends. I was incredibly moved by their work and the poignant but incredible stories of the people who rode here. If you would like to donate to the Ebony Horse Club, you can do so here. Make sure to follow them on Twitter, Facebook and YouTube as well. Thanks for writing about your experience of this club and the significance it plays in the community and these children’s lives. Dennis has the kind of smile that can melt anyone’s heart, it must’ve been so nice to see how his trepidation turned into exaltation. Great photos. Thanks Shing! That’s not actually Dennis, it’s a lovely little girl 🙂 I was working with Dennis so wasn’t able to take photos at the same time! Would love to go back and spend more time there. Oops, I blame the helmet! This is such a touching post and it gives me so much hope for the youth that clubs like this exist. 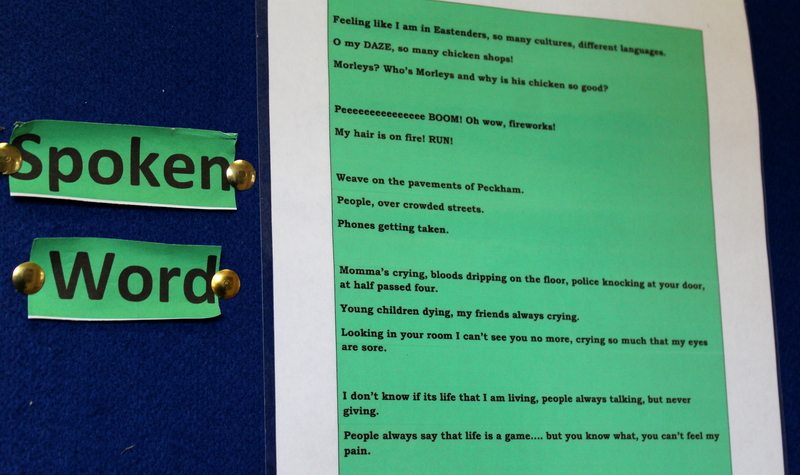 Thanks Mel – whether it’s horse riding or boxing, there are so many ways to channel energy and improve key life skills! Still want to check out that Dwaynamics place in Brixton too!